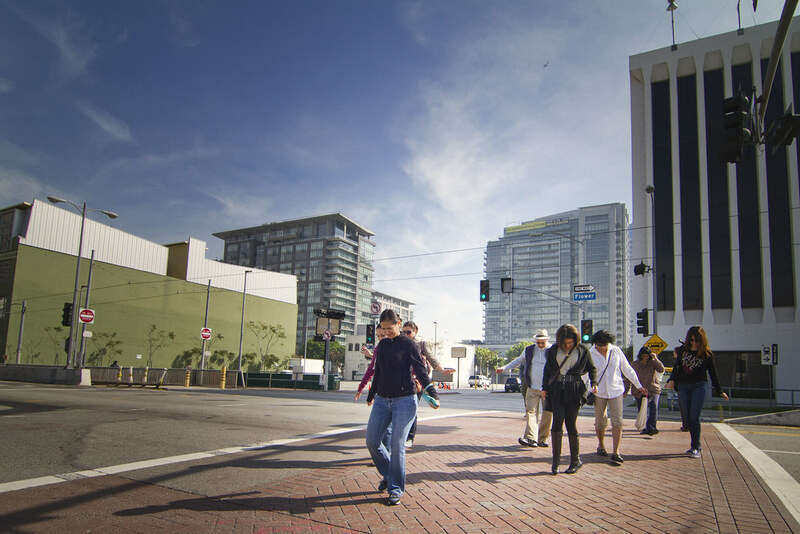 A lesson in “Being Pedestrian” comes to downtown L.A. The crosswalk dance across Flower Street offers a reminder of the short time window pedestrians are given to cross the street. Learning to drive a car is an almost universal right of passage for most Americans, and Angelenos are especially adept at understanding the unwritten rules of being a driver. The act of being a pedestrian, on the other hand, can be foreign and scary – and something that many Angelenos don’t have to worry about from the bubble of their cars, far removed from the uncharted territory of the sidewalk. However, as Los Angeles (with the help of Metro and other local agencies) redevelops and becomes more transit oriented, the lost art of walking will have to be rediscovered. This is where Being Pedestrian comes in. A self-proclaimed “cultural tourism agency,” Being Pedestrian at first appears to be your typical downtown L.A. walking tour – the kind that spotlights the area’s historic architecture and shiny new developments. It turns out that Being Pedestrian is something completely different and completely new. It is the remedial lesson in urban walking that L.A. needs to survive its transit oriented future. Being Pedestrian is the brainchild of artists Sara Wookey and Sara Daleiden – and is produced in collaboration of CRA/LA and Habeas Lounge. It aims to reinvent the downtown walking tour by focusing not on the developments, but on the act of walking itself. Through a series of simple but eye-opening exercises (walk backwards with a partner, walk shoulder to shoulder with a group, assert your presence to vehicles by holding out a commanding hand) pedestrians are reintroduced to the urban environment with a greater awareness. The walks end up being more performance art than anything else, but like all good art the experience opens the mind and incites discussion. On a recent Being Pedestrian tour with the Latino Urban Forum the post-walk discussions centered around the surprising inconsistency of the pedestrian experience from block to block and the unwelcoming feeling that the multi-billion dollar L.A. Live development imposes on pedestrians. “As a transportation planner we fail to ever discuss the experience of mobility. Its always a number, time, destination, or formula. Yet mobility is physical experience that we see, hear, tour and even feel. This human experience is what is lacking in transportation planning today. That must be why it is always an unfulfilled experience. On its website Being Pedestrian offers a guide to the experience and exercises for those wishing to go solo. A public event – which will include group walking tours – is planned for March 12 at Grand Hope Park in downtown L.A. This whole idea is about really breaking down perceptions and “thinking outside the box.” Not taking anything for granted and reconfiguring the entire point of being a pedestrian, and the related issues of public transportation. I hope more people catch on to this. There’s more to walking around Los Angeles, especially Downtown LA, than simply putting one foot forward after another. Yes, it takes experience and the know-hows in the art of walking to safely roam across the mean streets of LA. I can’t tell you just how many times I’ve nearly been struck by a car from drivers pulling out of parking lots and alleyways, and those making turns on streets without stopping. Then there are those who run red lights and stop signs during the late nights in Downtown LA because the streets are pretty much empty. If Right-Turn-on-Red is banned in all of downtown Houston, Texas, why could it not also be prohibited in downtown Los Angeles?